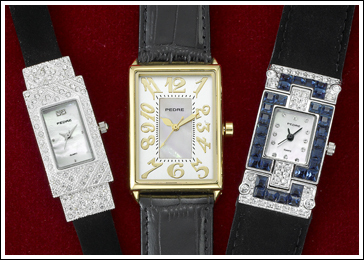 We love this selection of elegant and dressy Deco watches. The clear crystal rectangular pave surround (like part of a bracelet), lends a dramatic touch to the simple mother of pearl watch face (suede band). And because men should have beautiful accessories too, here’s a classic oversized watch face with Deco numerals, a gold bezel and a black leather strap. Finally, looking like it came from a very famous jewelry store, this stunning colored crystal-studded watch is really a work of art. They’re not really sapphires and diamonds around the mother of pearl face, but we won’t tell anyone (suede band). All watches have quartz movement and come in a black box.